Located on Blair Rd. NW just north of the intersection of Blair Rd. 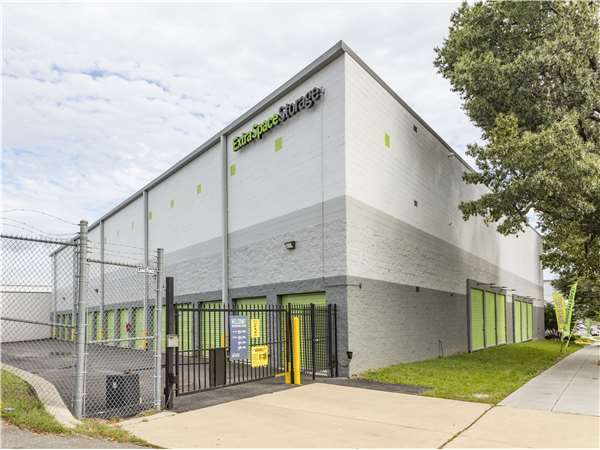 NW and Kansas Ave. NW, Extra Space Storage serves Northwest Washington, DC residents near Takoma Park, Chillum, and Silver Spring. Locals will recognize our facility next to Western Union across from Don Ciccio & Figli and Capital City Public Charter School. We're also accessible for residents of nearby apartments, such as The Blair, Longfellow Arms Apartments, Fort Totten Square, Chillum Place, and Tudor Place Apartments. The Associates are nice & the location is great for MD &DC. Very clean facility& the rates are awesome. I would recommend if u need space try this place. I've been having my personal belongings at the Blair Rd location for about half of a year and personally, I think I might have been better off looking elsewhere. To begin with the manager Nicole, I believe that is her name, has the most foul tone of voice when speaking to customers. I had an issue regarding my monthly payment and I decided to call the location. She said my up-charge has been taking place for about two months; when I let her know I did not receive any information regarding this monthly fee increasing, she responded with "you should have." I then asked her if she could let me know why this happened, and she couldn't help me. She did not bother to find a solution for me nor provide when the notification was sent. Instead she said one thing then said another but no clear answer to any of my questions. The facility has a very disgusting smell to it that sticks with all of your belongings and units aren't available after 10pm. There is no sense of security at the location, when people are unloading their cars or trucks and leave the door open for just anyone to come in, no one bothers to close the doors behind them. (And I'm not talking about the customers, if we're busy loading and unloading) There is a 24-hour camera which I'm not sure they have access to or not. A lot of things just aren't right at this location and I'm not quite sure if its because of the convenience of having such an easy job, but please do better. Very unethical and not satisfied at all! Very emotional process of storing my father's belonging. Staff very understanding - walked me through the process of identifying a unit that would best meet my needs (no hard sell...but honest support and kindness). Facility very neat/clean and staff are available/responsive during the posted hours. Also, I really appreciate the various security levels within the facility....'being watched' adds an extra level of personal comfort. The staff that I first met at Extra Space were very professional. I was able to get all of the information I needed and complete the rental process in a very reasonable amount of time. One of the staff was training and both he and the trainer were very thorough and efficient. On the day that I arrived with the movers, my experience was not so positive. The staff person was not helpful and seemed annoyed that I had questions. Overall, I'm very happy with my choice to rent at this Extra Space Storage facility and hope I caught the one person on an "off" day. Found ESS after searching a few in the area. To my amazement they were staffed with "the Friendliest Folks I could imagine. We all know how stressful moving ones belongings can be.. but ESS made it painless and cost effective. Their online systems are well created and provide the kind of features in today's electronic world to manage storage needs at any level of granularity. Need I say, convenience, access, lighting, boxes and supplies are readily at hand. Locations and available bin options are there for the choosing with great prices.. you can believe me, but do check to local competition, you'll find I'm right! Extra Space Storage was the right choice for me...! I had had bad experiences with self storage years ago, but this facility is so clean that I don't mind coming in! The office staff is very friendly, and I feel very safe. Drive south on Georgia Ave into the District of Columbia. Turn left onto Blair Rd. Continue straight onto Blair Rd NW. Our facility will be on your left immediately after Quackenbos St NW. Drive north on North Capitol St NE. Follow straight onto Clermont Dr NE. Pass Soldiers Home Cemetery. Continue north onto Hawaii Ave NE. Stay right onto North Capitol St NE. Pass Rock Creek Cemetery and continue straight onto Blair Rd NE. Our facility will be on your right just after Peabody St NW. Drive west on Riggs Rd. Stay right onto Oglethorpe St NE. Turn left onto New Hampshire Ave NE. Pass Legacy Memorial Park. Turn right onto Madison St NE. Take the first right onto Blair Rd NE. Follow onto Blair Rd NW. Our facility will be on your right just after Peabody St NW. Drive east on Military Rd NW and merge onto Missouri Ave NW. Turn left onto Georgia Ave NW. Pass the Walmart and then turn right onto Quackenbos St NW. Turn Right onto Blair Rd NW. Our facility will be immediately on the left.